You get the picture. He’s good. McKee is coming to London at the end of April to deliver his seminar to a large audience willing to invest a substantial amount of time and money. It’s out of my reach on both counts but as the seminar is closely based on his ‘bible’ STORY – Substance, structure, style and the principles of screenwriting I got hold of that instead. It surprised me just how much of the content is as relevant to novelists as those writing for the screen and this is a taste of the things I’ve learned. I worried that it might be difficult for me to follow as a non film buff with its huge number of film references (it was published in 1998 and hasn’t been updated) but I had seen lots of the films, most of which are very well-known (there was an impressive selection of non English language titles too). In any case, McKee is using the scenes to illustrate points and alternatives so he has to describe them in detail. Although it serves as an example of numerous points, the endless mentions of Casablanca did grate after a while (apparently day 3 of the seminar features a 6 hour frame-by-frame analysis…) Jaws and Kramer vs. Kramer get plenty of exposure too, as does Chinatown and many others I want to see even though I now know the plots inside out. I’m not a big reader of writing books. Stephen King’s highly acclaimed On Writing has sat on my shelf for years and I’ve done no more than dip into it (though I will read it now). Since I’m in the planning stages of my second novel, it felt like a good time to read McKee’s 460 page doorstop cover to cover. The tone of the book is rather grandiose and for a work which strives to discourage cliché at all costs, it isn’t without a few of its own, but I didn’t find this off-putting (in fact, in places it was unintentionally funny). 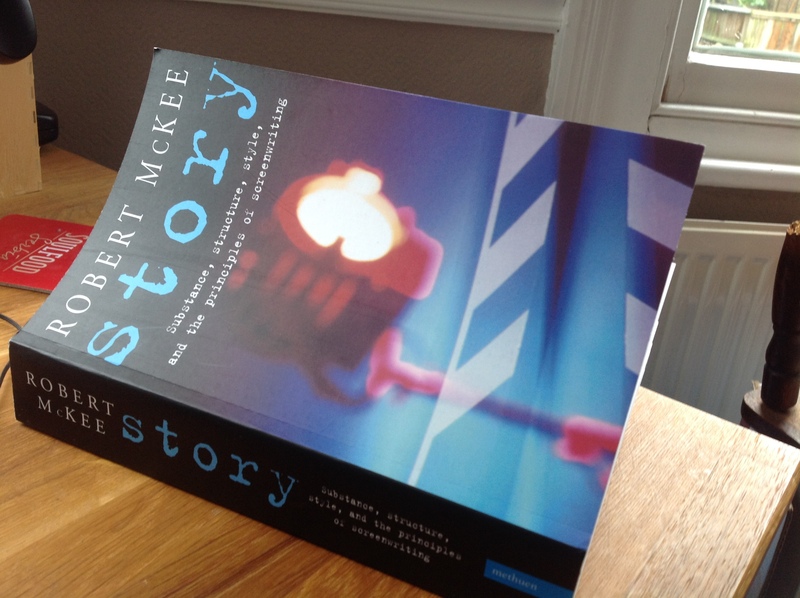 Overall it was enjoyable and easy to read and McKee’s generosity as a teacher comes across. (OK, he’s sold millions but this is a lot of insight for £20.) Parts of the book are undeniably dense and technical with diagrams which look intimidating on first sight but do the job better than words. So why would a novelist spend five days studying a screenwriting guide? Movies (I’ll use his term this once) and novels both aim to tell a story in the most compelling way possible, gaining and holding the audience/reader’s interest, getting them to invest emotionally in the characters and care about what will happen to them, i.e. how the story ends. That’s what keeps people watching/reading instead of falling asleep or giving up halfway through. But all McKee can do is give a writer the tools. When it comes to a story which will cost millions to shoot or thousands to publish, no amount of craft or even literary talent will cut it if you haven’t got something to say – something that can only come from you, the writer, but which has universal resonance. Tall order, isn’t it? I’ve been fascinated by story structure for years. At college I studied the three-act structure on which many narratives are based in relation to classics of literature and more recently I’ve attended short workshops on it, but STORY has deepened my understanding of how it relates to my own writing no end. It was interesting to see how the book I’ve already written measured up (although I’m glad I didn’t subject the previous version to such scrutiny). There weren’t many concepts that were completely new – anyone with experience of screen- or novel writing should be familiar with the tenets of how to handle exposition (sparingly, invisibly) and dialogue (dramatically, not realistically) for example – but the book goes into a lot of very practical detail. Take the section on conflict, which I found particularly valuable. It would be impossible to write about happy, well-adjusted people living a wonderful life in which their every dream comes true. It’s not just boring for the audience, it’s false – reality isn’t like that. Story is metaphor for life, and to be alive is to be in seemingly perpetual conflict. Nothing moves forward in a story except through conflict. The protagonist has to desire something that the forces of antagonism prevent them from getting in the form of conflict. So far, so black and white. But it isn’t, of course. There is conscious desire and unconscious desire and a complex and satisfying story will have both, as well as elements of all three types of conflict: inner (emotional, mental), personal (lovers, family, friends) and extra-personal (environmental, societal, political, etc). This (and I really am scratching the surface) has given me a lot to reflect on as well as reinforcing my belief that story and character are inextricably linked and equally important. Reading STORY has given me new respect for screenwriters and the challenges they face. Often when writing I’ve envied the way they can trust the right actor to convey emotion through expression and physical gestures which can so easily be stifled with words. But as McKee says several times, it is only the novelist who can enter the thoughts and emotions of the character and allow direct access to their interior lives. This has provided me with a lot of inspiration for the next book I write. It’s hard to believe how much it’s taken shape in the space of just one week. Have you read STORY or attended Story Seminar? Or maybe there’s something else you swear by – if so, I’d love to hear about it. Next week, I’m delighted that Naomi Wood, author of Mrs Hemingway, one of my Fiction Hot Picks 2014 will be opening a new regular feature on the Literary Sofa, Authors on Location. This slot is inspired by my own love of travel and by the many novels I’ve read recently with particularly vivid, well-drawn or exotic locations. A long time ago I studied screenwriting at the University of California and many of the points that you highlight from Kee’s Story were rammed into my brain then — the three acts, the necessity of conflict and (in commercial films at least) brevity to the point of terseness. I was sceptical, halfway through an English university arts course that included much that was oblique and esoteric, but most of the basic tenets of storytelling are undeniable once you start to look for them. I can watch a film now and immediately identify the plot points at the end of the acts. It’s fascinating to wonder whether we’re ‘hardwired’ as humans to react in this way. I’ve got ‘Story’, after it was recommended to me by many people but I’ve not read it back to back. One similar book that I did read quite compulsively was John Yorke’s ‘Into the Woods’, which is similar but more up-to-date and uses examples from British TV as well as films and novels. He argues (in places) for a five act structure but they’re all variants of the same general theme. Yorke also runs seminars. Another reason why modern novelists benefit from screenwriting techniques is the reader’s familiarity with visual media — often writing advice uses terms like ‘scenes’, ‘cut’ and ‘close up’ — and a contemporary reader may be conditioned to react to screenwriting’s cues. In my MA I adapted part of my novel into a 40 pages of screenplay — an interesting exercise in cutting the narrative to the bone. Another very insightful contribution, thank you Mike. I must get hold of INTO THE WOODS as several have mentioned it and also SOLUTIONS FOR NOVELISTS. I found it really helpful taking STORY at my own pace and being able to break off/take notes, etc when I needed time to absorb something relevant to my own work, so I’m less convinced that seminars are for me. With this kind of dense subject the fatigue can set in very quickly. I definitely think you have a point about readers’ familiarity with cinematic writing playing into the way we write novels, even subconsciously. I’d also recommend Into the Woods. John Yorke is fantastic – his 5-act structure has transformed the way I approach structure. Must try Story at some point myself. I’m reading this at the moment, and find it helpful, it certainly seems at the moment to be a lot better than most ‘how to write’ books. Thanks for recommending it! Glad to have put you onto something so useful, Ruth. Do let me know how you get on with it, especially if you’ve chosen to dip in and out rather than devour. I’m sure there are many ways to consume this information! I was very interested to read of your experience Isabel. I went to one of McKee’s seminars, about six years ago I think, and read the book compulsively, as you did, I found it quite mesmerising. Your post has inspired me to re-read it now. I recently read Into the Woods by John Yorke, as mentioned by Mike above. That reminded me quite a bit of McKee’s book, though he has more to say about the deep and enduring appeal of stories, and the particular elements that hit the nerve for readers. I’m taking a particular interest in Yorke’s course at the moment as one of the participants on it is using Honor’s Shadow to create a TV treatment, something I’m following with enthusiasm! That’s so exciting – you must be on tenterhooks to see the end results! I get the impression many of my friends who’ve done writing MAs are familiar with McKee’s book. It was time for me to catch up. I read Story a few years ago, and coincidentally just recently lent to it a friend who had heard about it and was wondering whether to buy it or not. I remember finding it very instructive when I first read it, but now it always makes me think about the film Adaptation by Charlie Kaufman, in which the fictional screenwriter Charlie Kaufman goes to one of McKee’s seminars, and then writes a screenplay which upends most of McKee’s cardinal ‘rules’. Great post isabel, I’ve never read “Story” but have long known of it, so I’m going to order it and fill that gap. I have read SK’s “On Writing” which I found entertaining throughout, and parts of it were useful for me. He has a good grasp of what it is to be a writer. The only thing that jarred with me was his insistence that you need to shut yourself away and write for 8 hours a day… just not possible in my situation, but other than that I really like it “On Writing”. I’ve also read “Solutions for Writers” by Sol Stein and I found that very helpful, clearly written without too much jargon. There was a lot in that book that resonated with me and it helped when I was writing my first novel. Hi Louise As you can tell, reading STORY has been a big inspiration to me and lots of others so I hope you get something out of it too. Ah yes, the people who recommend writing for eight hours a day -(Have you noticed they’re almost always men?) well, even if I had no distractions or other committments I couldn’t do that, nor would I want to. What about real life? Great post, Isabel. I’ve dipped in and out of Story and found it useful, but maybe reading it cover to cover would be even better. A few people have recommended Into the Woods recently, so I’m definitely going to order that. I’ve read SK’s On Writing twice and find it hugely motivating. I’m starting to change my mind about writing books, or at least good ones written by people who know their stuff. There’s a distinction between what they say and the kind of useless writing cliches and mantras which really get on my nerves and make me want to do everything they say you shouldn’t! Our class used extracts from ‘Story’ as part of a our MLItt course and I might now take a closer look at the full book. I’d also recommend On Writing, as much for the personal history of Stephen King’s career as for the writing tips. I’d come across STORY very briefly when it was mentioned by my tutor at City Lit way back – heaven knows why I didn’t get hold of it then, but actually I think if I’d read it before writing at least one novel it might have scared the hell out of me! I am currently reading Bambi vs. Godzilla, David Mamet’s magnificent collection of essays about Hollywood, screenwriting, the business and art of film, and so very much more. I could not recommend anything I have ever read about writing and the rest of it any more heartily. If for no other reason it should be read because of his amazing use of language.